I really wanted to name this one something like “All-The-Flavors-Of-Thanksgiving-In-One-Bite Freezer Meal”, but that seemed like quite a mouthful (pun intended). So let’s just go with, “Thanksgiving Dinner Casserole”, shall we? This is a very easy dish to put together, and it uses all of your leftovers from Thanksgiving dinner. And it does have all the flavors of that dinner together in one dish. 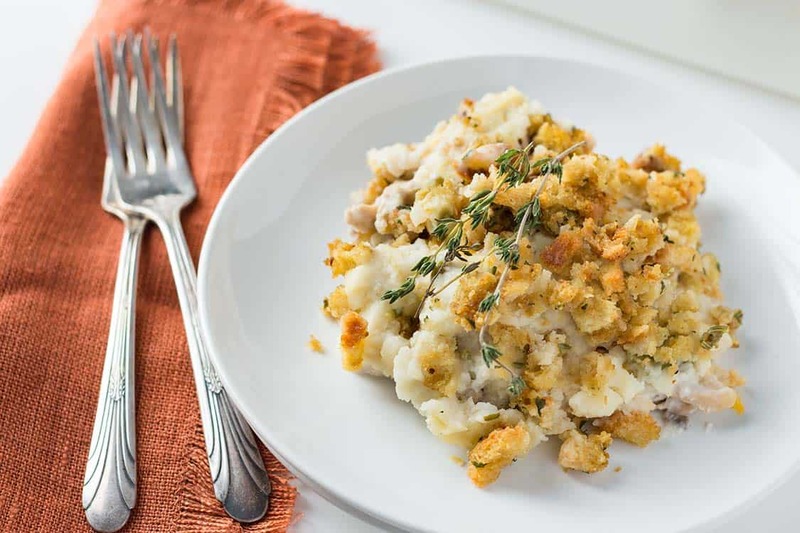 It’s basically a mash-up of several Thanksgiving leftover recipes. I wanted to try to get the best of all them, all in one easy freezer meal. We love Thanksgiving leftovers at my house and I always make sure to have plenty, because I figure if I’m going to go through all that work, why not make as much as I can so we can enjoy it for as long as possible. Right? I mean, it’s basically the same amount of work to roast a 10 lb turkey as it is a 24 lb turkey. And it’s only a few more minutes of potato peeling to make a triple batch of mashed potatoes as it is a single batch. But realistically, one can only eat Thanksgiving leftovers for lunch and dinner for so many days in a row before it does tend to lose its novelty. And I hate throwing away leftovers. So I created this recipe from a couple of different ideas for using up Thanksgiving leftovers. 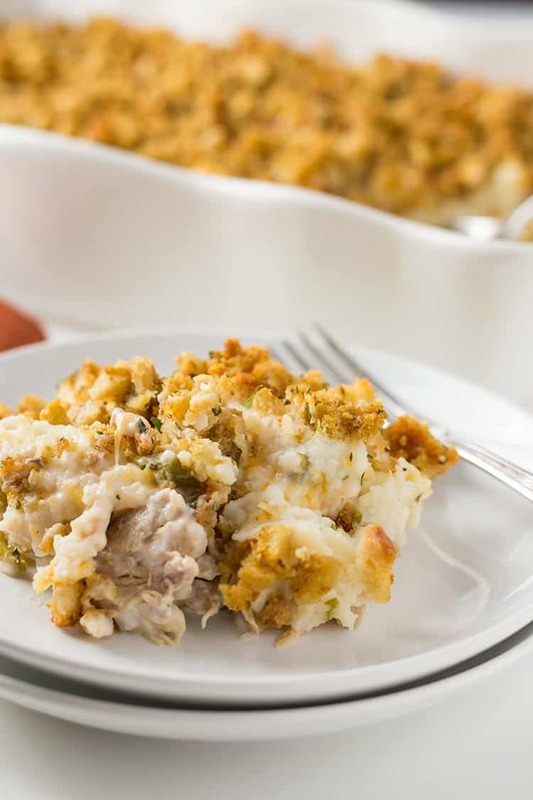 The idea is to eat your fill of Thanksgiving leftovers after the big meal, but then when you’re ready to move on, don’t throw away whatever is left, but use it in a freezer meal so a month or two from now, you can enjoy Thanksgiving dinner flavors all over again! But this time without all the work. It will keep nicely in the freezer for several months, but it’s such a great meal I doubt it will take that long before you’re ready to pull it out and serve it! Enjoy all the flavors of Thanksgiving dinner together in one easy dish! 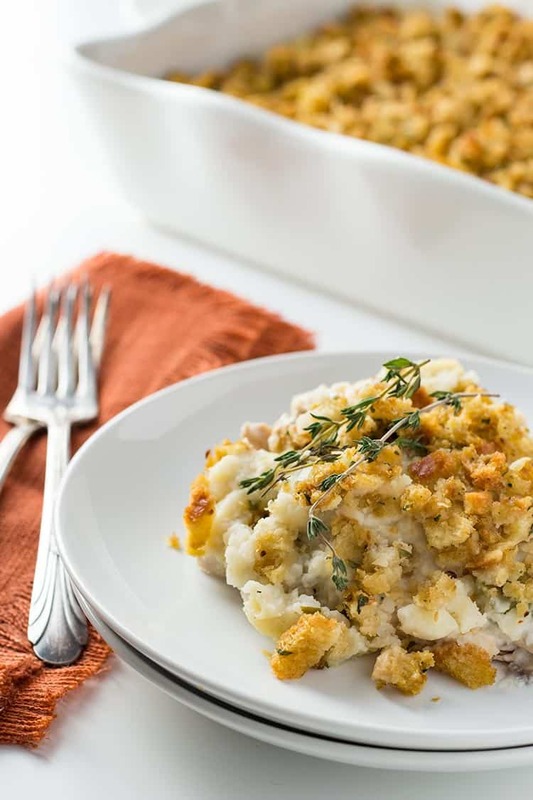 Make the most of your leftovers by putting together this freezer meal - then you can enjoy Thanksgiving dinner any time you'd like, without all the work! Spray 9x13 baking dish or aluminum pan lightly with cooking spray. Spread shredded turkey in bottom of dish. In medium-sized bowl, combine soup, sour cream, green beans, onion, salt and pepper. Spread mixture evenly over shredded turkey. Sprinkle shredded cheese over soup mixture. 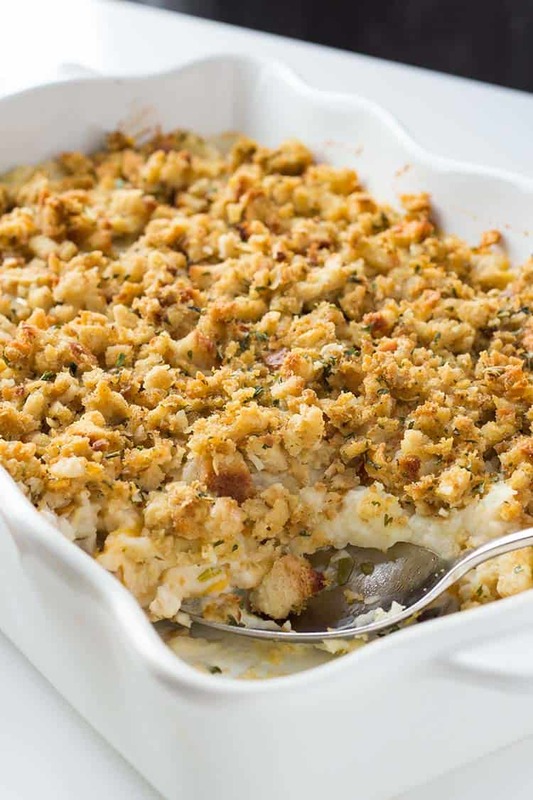 Top with a layer of prepared stuffing mix or leftover stuffing. Cover with aluminum foil or lid. Label and date, then place in freezer. Bake uncovered at 350 degrees Fahrenheit for 35-40 minutes until bubbly and topping is lightly browned. Garnish with crushed fresh thyme or a dollop of cranberry sauce!